B1 Class closed foaming rubber elastomeric insulation rubber foam sheet – Huamei Glass wool Rubber foam Manufacturers, Huamei Energy-saving Technology Group Co., LTD.
Embossed pattern rubber and plastic board is a new type of rubber and plastic insulation board which integrates heat insulation, decoration and noise reduction, which has been developed by Huamei group for a long time. 1. Huamei embossed rubber and plastic board is more practical, not only has the superior performance of Huamei rubber and plastic, but also has strong decoration. 2. Huamei embossed rubber and plastic board has a relief pattern and relief group logo, and printed with three rows of equidistant white product logo, its design is very beautiful, with beautiful appearance, novel design, strong sense of three-dimensional and many other advantages. If the relief face is used inside, it can also increase the bonding strength between the equipment and the rubber and plastic. If the relief face out of use, in addition to enhance the decorative, but also increase the product sound-absorbing noise reduction function. Conductivity factor is a very important index to measure the heat-insulation effect of the heat-preservation material .The lower the conductivity factor is, the better the heat-insulation performance will be. Conductivity factor of this material is 0.034w/m• k at average temperature 0 ℃ . As this product has high surface heat liberation rate, using the product with thinner thickness can get the same heatpreservation result as the traditional heat-preservation material at the same environmental conditions. 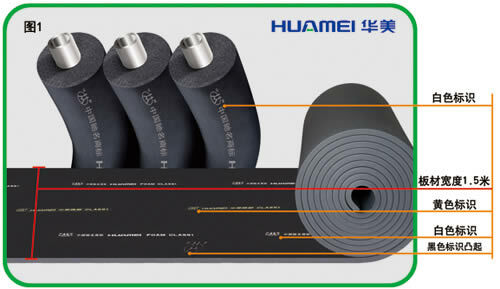 Huamei Brand Rubber Plastic Heat-Insulating & Heat-preservation Material has high elasticity, can reduce the vibration and resonate of the hot/cold water pipes in use in the largest degree. Huamei Rubber Foam Insulation owes perfect aperture-closing foam structure, all apertures are independent each other. The nonconnected air bubble forms the closed air layer that can enhance the heat-insulation performance efficiently, meanwhile the independent aperture-closing structure of can form much hindrance to moisture, even if the surface of the material was damaged, It also can prevent the water vapor into the inner material, so that maintaining the long-term steady of the heat-insulation effect at the same condition; the conductivity factor of water is 24 times higher than air’ s, while the non-aperture-closing structure is in reverse. Huamei Brand Rubber Foam insulation materials have good flexibility and tenacity which makes it easy to handle bent and irregular pipe in construction, saving both labor and material. Because of the good softness, this product is easy to be installed.Tube Installing: The tubes can be installed after assembling or cut up them longitudinally and bind them with glue. With completed parts such as valve, three-way connection and elbow pipe, cut sheet material up and wrap those completed parts with the cut plate according to different shapes and then bind them together. That installing method guarantees the tightterial has smooth and straight surface as that of rubber and excellent performances, it is not needed to insert sealing layer or prevention layer, reducing the trouble in the construction and also guarantee that the installed appearance is beautiful and smooth. During the time of maintenance of equipment and pipe, the rest cut out from the material can be reused, which has the same performance. Huamei Rubber Foam insulation Heat-Insulating & Heat-preservation Material can be used safely. Our products neither stimulate the skin nor harm health. The product can prevent mould from growing. They have excellent performance of acid-resisting and alkaliresisting. Because of those excellent performances, Huamei Rubber Foam insulation Heat-Insulating & Heat-preservation Material has become as an ideal heat-insulating material to protect pipe and tubes against environmental corrosion. Material should be better than grade C when using in building fields. Note: The quality indexes of grade B2 products are in accordance with Class Ⅱ, GB/T17794—2008Preformed Flexible Elastomeric cellular thermal insulation,used in the non-construction field . 1. 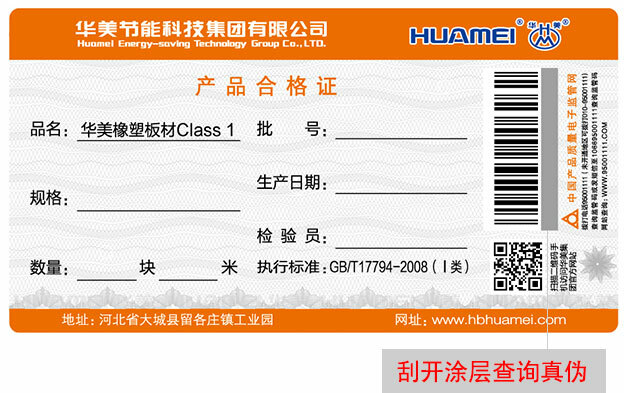 Huamei brand rubber plastic exclusive electronic supervision code for a piece of product is printed on the quality certificate with the package. Users can free inquire for truthfulness by calling/ messaging 95001111 or logging on electronic supervision web www.95001111. 3. The corporation trade mark and name are printed on the face of the product outer package, the identification, notes and product grade for proving product quality.